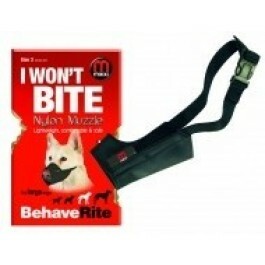 This easy-to-fit muzzle allows panting, drinking and treat training. The Mikki "I Won't Bite" Muzzle is a lightweight, comfortable and a safe alternative to the traditional basket muzzle. It will allow your dog to pant, drink and treat train and comes complete with an adjustable strap with easy-fit snap lock. The muzzle also has a collar attachment to prevent your dog from pulling it off. If your pet is keen on chasing other animals or shows predatory signs, then a muzzle can prevent injury or death. Additionally, if the dog bites he MUST be on lead for everyone's safety. Size 1XL is suitable for small breeds such as Cavaliers, Dachshunds, Jack Russells, Westies, and Whippets with a nose size of 13cm. Specially suited to short-nosed breeds. Allow enough space for you to slide one finger inside the muzzle, around the side of your dog’s nose (fig. 1). 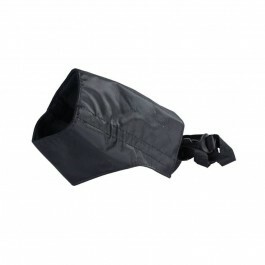 This will enable them to pant, drink and for you to give titbits during training sessions. Practise putting the muzzle on, then reward and praise your dog to encourage him to relax (fig. 2). Attach the Velcro loop to your dog’s collar for extra security. When first introducing the muzzle to your dog, only put it on for short periods of time, building up until he is used to it and comfortable with how he feels. Post your own review ! *How do you rate this product ? By publishing your opinion, you accept our conditions of publication.